Blogs > Steve Hochstadt > What is Antisemitism? Steve Hochstadt teaches at Illinois College and blogs for HNN. Antisemitism is alive and well these days. In Europe and America, the number of antisemitic incidents areincreasing every year, according to those who try to keep track. News about antisemitism has recently wandered from the streets and the internet into the halls of Congress. The presence of two newly elected young Muslim women in the House, who openly advocate for Palestinians against Israel, has upset the strongly pro-Israel consensus that has dominated American politics for decades. 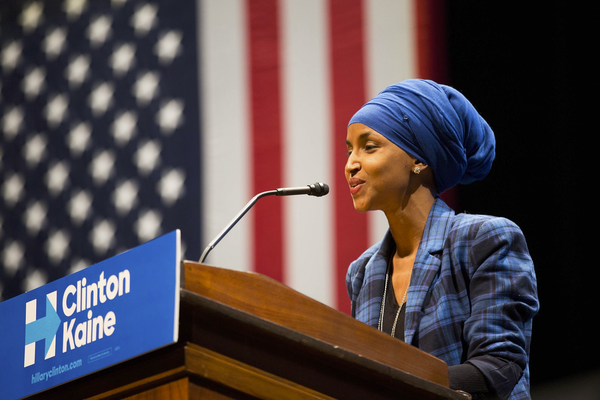 Accusations of antisemitism are especially directed at Ilhan Omar from Minneapolis, who has used language that is reminiscent of traditional antisemitic themes in her criticism of Israeli policies. Her case demonstrates that it can be difficult to distinguish between unacceptable antisemitism and political criticism of the Jewish government of Israel and its supporters. Some incidents seem to be easy to label as antisemitic. For example, when a large group of young people physically attacked Jewish women while they were praying. Many women were injured, including the female rabbi leading the prayers. The attackers carried signs assailing the women’s religious beliefs, and the press reported that the women “were shoved, scratched, spit on and verbally abused”. An obvious case of antisemitism? No, because the attackers were ultra-Orthodox Jewish girls and boys, bussed to the Western Wall in Jerusalem in order to attack the non-Orthodox Women of the Wall, who were violating misogynist Orthodox traditions about who can pray at the Wall. This incident fulfills every possible definition of antisemitism. For example, the International Holocaust Remembrance Alliance offers the following description of public acts that are antisemitic: “Calling for, aiding, or justifying the killing or harming of Jews in the name of a radical ideology or an extremist view of religion.” The ultra-Orthodox leaders who encouraged the assault would argue that they were protecting, not attacking Judaism, and that the Women of the Wall were not really Jewish anyway. Acts of antisemitism are political acts. Accusations of antisemitism are likewise political acts, deployed in the service of the political interests of the accusers. Many, perhaps most accusations of antisemitism are made in good faith for the purpose of calling attention to real religious prejudice. But such accusations are often made for less honest political purposes. The Republicans in Congress who demand that Democrats denounce Ilhan Omar are cynically using the accusation of antisemitism for political gain. Many Republicans have themselvesmade statements or employed political advertisements that are clearly antisemitic. The rest have stood by in silence while their colleagues and their President made antisemitic statements. But they saw political advantage in attacking a Democrat as antisemitic. Supporters of the Israeli government’s policies against Palestinians routinely accuse their critics of antisemitism as a means of drawing attention away from Israeli policies and diverting it to the accusers’ motives. Sometimes critics of Israel are at least partially motivated by antisemitism. But the use of this rhetorical tactic also often leads to absurdity: Jews who do not approve of the continued occupation of land in the West Bank or the discrimination against Palestinians in Israel are accused of being “self-hating Jews”. This linking of antisemitism and criticism of Israeli policy has worked well to shield the Israeli government from reasonable scrutiny of its policies. In fact, there is no necessary connection between the two. Criticism of current Israeli policy is voiced by many Jews and Jewish organizations, both religious and secular. Supporters of the idea of boycotting Israeli businesses as protest against Israeli treatment of Palestinians, the so-called BDS movement, are sometimes assumed to be antisemitic and thus worthy of attack by extremists. But the pro-Israel but also pro-peace Washington Jewish organization J-Street argues that “Efforts to exclude BDS Movement supporters from public forums and to ban them from conversations are misguided and doomed to fail.” I don’t remember that any of the supporters of boycotting and divesting from South Africa because of its racial policies were called anti-white. Those who advocate a “one-state solution” to the conflict between Israel and the Palestinians are sometimes accused by conservatives of being antisemitic, with the argument that this one state will inevitably eventually have a majority of Muslims. The Washington Examiner calls this equivalent to the “gradual genocide of the Jewish people”. The absurdity of equating anti-Zionism with antisemitism is personified by the denunciations of Zionism and the existence of Israel by the Orthodox Satmar, one of the largest Hasidic groups in the world. On the other side, the most vociferous American supporters of Prime Minister Netanyahu’s government have been evangelical Christians. Although they claim to be the best friends of Israel, the religious basis of right-wing evangelical Christianity is the antisemitic assertion that Jews will burn in hell forever, if we do not give up our religion. Robert Jeffress, the pastor of First Baptist Church in Dallas, who spoke at President Trump’s private inaugural prayer service, has frequently said that Jews, and all other non-Christians, will go to hell. The San Antonio televangelist John C. Hagee, who was invited by Trump to give the closing benediction at the opening of the new American Embassy in Jerusalem, has preached that the Holocaust was divine providence, because God sent Hitler to help Jews get to the promised land. Eastern European nationalists, who often employ antisemitic tropes to appeal to voters, are also among the most vociferous supporters of Netanyahu and Israel. Political calculations have muddied our understanding of antisemitism. Supporters of the most right-wing Israeli policies include many people who don’t like Jews. Hatreds which belonged together in the days of the KKK may now be separated among right-wing white supremacists. But no matter what they say, purveyors of racial prejudice and defenders of white privilege are in fact enemies of the long-term interests of Jews all over the world, who can only find a safe haven in democratic equality.